What's in the Box (Package)? 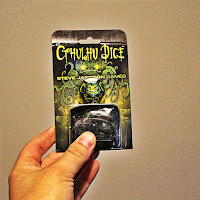 Cthulhu Dice is a quick and dirty roll and play game. Each player takes on the role of a cultist attempting to keep her/his sanity longer than the rest of the players. Players take turns selecting a target cultist (victim) and roll the Cthulhu die to attempt to steal their sanity. 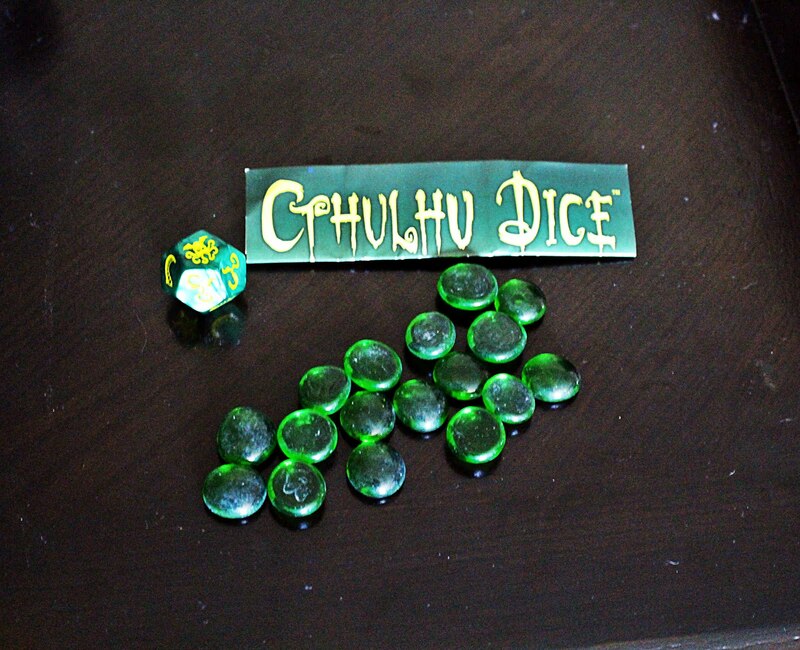 Depending on the luck of the roll, players may gain sanity from their victim or Cthulhu, the victim's sanity will go to Cthulhu (the centre of the table), or everyone loses a sanity to Cthulhu. The game ends when there is only one sane cultist or when all players lose their sanity to Cthulhu. This week Cody and I took on a new role, as we spent our time rolling away our sanity while trying to summon the Old One in Cthulhu Dice. As per the norm, it was just the two of us playing, which changed the rules a little from a standard game of Cthulhu Dice. Instead of playing a single cultist we each controlled two cultists, meaning that we were not only competing with each other but also ourselves. This gave the game an almost out of body experience and made it a little less tense than we would expect for a roll and play game. In the end, we both had multiple victories and Cthulhu didn't take a single victory! This game sparked quite a bit of debate here at Lost Loot Games, regarding theme and small games - which made me like it more. From a board game design perspective, we thought it was really cool that you can successfully make such a game that is so minimalist. The game fits a niche market for people looking for a game with a tiny footprint and/or those looking for an inexpensive game ($7.50 CDN). That said, as a lover of more complex games, I question why not put a little more into the game? It may fill a gap in the market for board game enthusiasts who are going backcountry camping and really can't afford the extra space/weight but for those of us sitting at home will we pick this game over the hundreds (?) of other meatier Cthulhu games? On a separate note, I would also like to briefly comment on the theme, personally, we found the theme a little backwards. Generally, in Cthulhu/Lovecraft games, the investigators are the ones with the sanity and the cultists are already crazy (which is why they are trying to summon the old ones). With all that in mind, I will say that I like that the game fits into a small ziplock bag and can be played basically anywhere. I also LOVE the Cthulhu die and would buy it just for that... So if you are an H.P Lovecraft fan, or you are looking for a game with a small footprint this might be a perfect fit. It is also an interesting game to check out if you are working your way into board game design - giving you a chance to look at making games with small footprints and investigating what constitutes a game. Lastly, I will say that as warned when we received the game, the game would likely be tenser in a game with a higher player count. 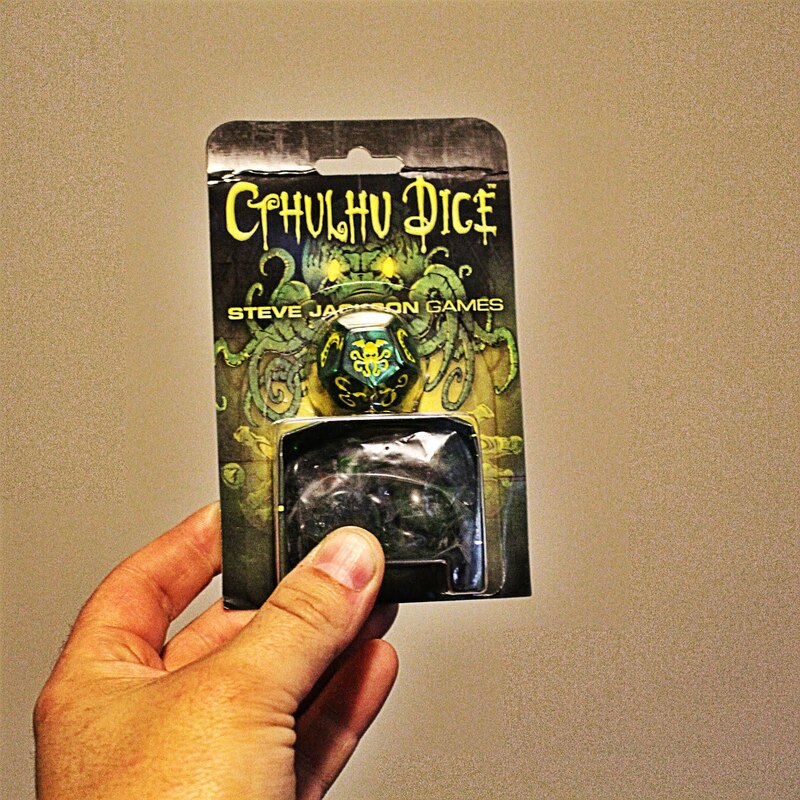 Lost Loot Games would like to thank Steve Jackson Games for the review copy of Cthulhu Dice. We were not otherwise compensated, nor did this impact our opinions on the game.